Wonder Momo © 1987 Namco, Limited. An excellent side-scrolling beat em up game. 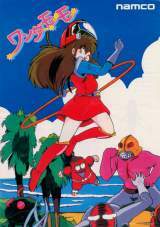 We play with a beautiful teen actress named Momo, through various theater levels, she must face of all enemies from the 'Warudemon' Phantom Army, with kicks and double kicks and must pick up a tornado item to get the ability to turn into 'Wonder Momo' using his super suit that lets throw his 'Wonder hoop' and the powerful 'Wonder Typhoon'. When you reach the end of each level, a boss appears and has to be defeated to unlock the next stage. 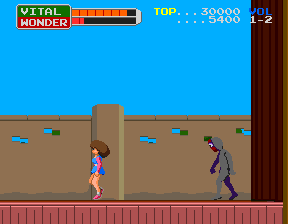 Wonder Momo was released in February 1987 in Japan and is Namco's last 8-bit game. When the game is first started, players are treated to a parody of the MGM logo featuring Momo. The sequel is starring by his daughter 'Momoko' a teen idol in a battle to save Tokyo city and the universe! Alfa Records released a limited-edition soundtrack album for this game (Namco Game Music Volume 2 - 28XA-171) on August 25, 1987. [JP] NEC PC-Engine (apr.21, 1989) "Wonder Momo [Model NC64001]"
[JP] Sony PlayStation (oct.30, 1997) "Namco Museum Encore [Model SLPS-01050]"
[JP] Sony PlayStation (oct.30, 1997) "Namco Museum Encore [Shokai Gentei Special Box] [Model SLPS-00765]"
[JP] Sony PlayStation (oct.28, 1999) "Namco Museum Encore [PlayStation the Best] [Model SLPS-91163]"